Cleansing oils may be great, but at heart I always love a good sudsy face cleanser. There's something about seeing and feeling a cream or gel lather up that makes me feel like the formula is sweeping away all traces of dirt, oil, and makeup and leaving my face extra clean. 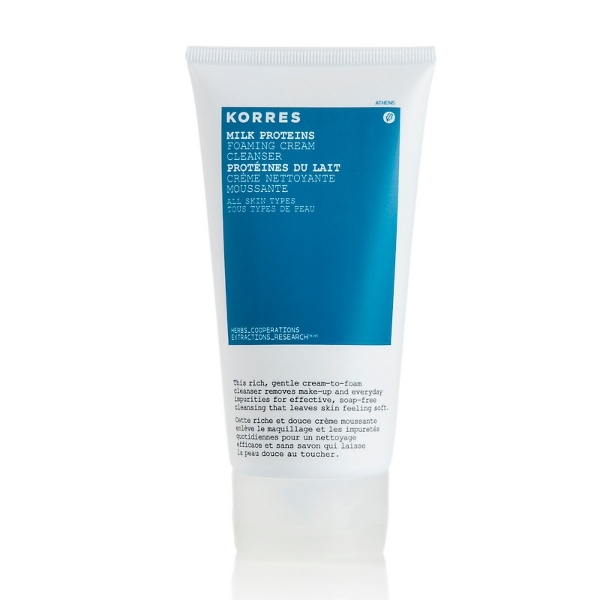 Korres Milk Proteins Foaming Cream Cleanser ($26 at Shoppers Drug Mart) is a recent addition to the "foaming cleansers I have tried and liked" category. This is a gentle but effective formula that falls more on the gentle side. On days where I wear little to no makeup, washing my face with this cleanser once is enough to get everything. If I have a bit more on my face though, I find it doesn't lather as well and I have to wash my face twice. The cleanser's rich foam is gentle enough that I can do so without drying out skin. Bonus points: It's 86.4% natural content and contains willow bark extract, which has mild exfoliation and deep cleansing benefits.